The InvizBox Go portable VPN and Tor router has finally been released in a pre-Christmas scramble that saw the devices sent out to the original crowdfunding backers. The device which was launched on crowdfunding site Kickstarter in late 2015 was slated for a February 2016 release date but as with most crowdfunded projects the release date was pushed back on numerous occasions due to delays, improvements and the powers that be. Just a few days before Christmas the team behind the InvizBox Go worked 25 hours per day, 8 days per week to finally push the finished devices out the door and on 22nd December shipments began. The devices ship from Ireland and will reach far flung corners such as the US at the earliest on the 26th December. Backers of the device in closer locations may receive their devices before Christmas but after continual updates and a project that kept backers in the loop it is unlikely that anyone will have any complaints about a further few days shipping delay due to the holiday period. The team behind InvizBox Go are no stranger to launching crowdfunded security devices as in 2015 they launched their initial project the InvizBox. 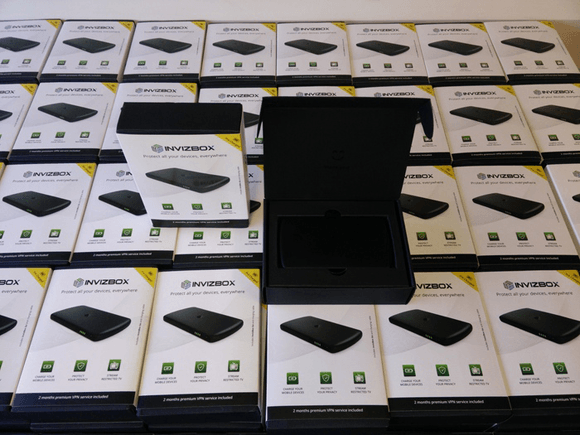 InvizBox brought portable Tor access to the market but InvizBox Go which raised just over €100,000 aims to build on that launch pad by including VPN access built on the network of our number one rated VPN provider IPVanish and including further value added features such as a built in power bank. While backers will be receiving their finished product in the coming days and weeks users interested in purchasing the device directly can now do so via the InvizBox Go website. A selection of options are available to purchase which include 1 device plus 2 months VPN subscription for US$99, 1 device plus 12 months VPN subscription for $139, 2 devices with 12 months VPN subscription for $250 and 1 device with a lifetime VPN subscription for $399. The InvizBox Go is likely to be a game changer for mobile security and past support from the InvizBox team on their initial product shows that users are likely to have a good experience with their latest device and future updates. We’re eager to get our hands on a test device and will be bringing you a review as soon as the device lands at our office and we’ve had time to play around with it.